Inflationary Crack-up Boom has Commenced in the G7 Economies! Make no mistake, we are in the latter category (total catastrophe) throughout the G7, unfolding over the next four years or less, but many opportunities are presented during these periods as these booms create Mal-Investments, MISPRICED ASSETS AND MARKETS OF ALL STRIPES; some will zoom higher and others lower. In the G7, Mal-Investments have been piling up for almost three decades as credit was turned into an entitlement and as easy money (money below the rate of inflation) became a policy of G7 central banks and banking systems. Combine this with tax, spending and entitlement policies created by public servants, mandates, overregulation and misstated inflation numbers – which generated excess demand in many UN-ECONOMIC sectors – and many of these economies have been converted into asset-backed economies. Now as the debt pyramids collapse, so do the industries, businesses, state, local and federal government programs which were supported by them. The collapse of income and living standards in the G7 (trough misstated inflation) is combining with the “something for nothing” broad social trend to push the “Crack-Up Boom” into a higher gear. Mal-Investments are collapsing at an increasing rate, and public servants and central banks are reacting predictably. 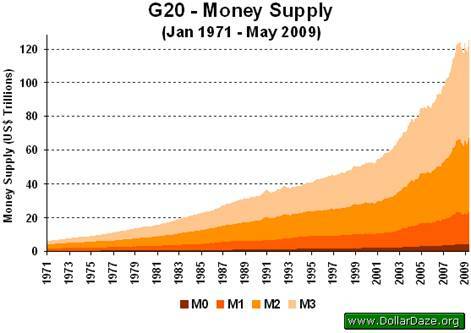 They are printing the money as they always have and always will, accelerating the arrival of the global CRACK-UP BOOM. They are explicitly saying they will print the money. “While the private sector during the bubble years brought U.S. debts to a record 3.7 times the entire nation’s output, now it’s the public sector that does the borrowing. The Obama Administration is adding to the accumulated U.S. debt at a suicidal pace – four times faster than the record set just last year. And America’s central bank hands the borrower a loaded pistol; it is adding bank reserves – which allow the money supply to expand geometrically – at a 4,500% rate. That last number is not a typo. It’s an alarm. If the Federal Reserve were a heart patient, the defibrillators would be on already. If it were a normal bank, it would be closed down immediately. For decades, public servants and socialists in the G7 have quietly been socializing the economies in which they reside, destroying the wealth creation of the formerly capitalist economies in which MIDDLE CLASSES were healthy and growing and their wealth was accumulating and savings were growing. They are transferring the wealth production of the private sector into public sector hands through one means or another. To name a few, these means are high and rising taxes -- directly through taxes and fees and indirectly through the confiscation of wealth from FIAT money and credit creation (stealing the purchasing power of your savings and wages while it sits in your bank accounts). Ever increasing mandates destroy innovation from rising businesses so established corporations can SQUASH the benefits of capitalism. They do so by BUYING the entrenched public servants through funding their reelections with campaign donations. Then the public servants create rules and regulations to “protect you” from innovations from rising new entrepreneurs and businesses, depriving the formerly CAPITALIST economies in which they reside of NEW innovations which provide every man “more of everything for less”. 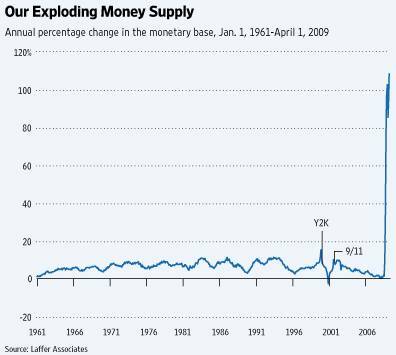 Capitalist economies have a natural type of disinflation which is ESSENTIAL for creating a more stable fiat currency system. Creative destruction is where new entrepreneurs and businesses create products and services superior to existing ones at a lower price. Consumers act in a rational manner and choose them over established businesses to MAXIMIZE the wages they are paid and the benefits their families by allowing them to consume more for less. In its place, they substitute CORPORATISM, a system of entrenched corporations which OWE their ability to stay on top of their industries and sectors to the public servants who are dependent on them for funds needed for reelection. Name me one entrenched business that does not give to ALL public servants for reelection. Both RIGHT and LEFT are funded equally and to the maximum allowable limits. So corporatism substitutes regulation, which MANDATES their way of doing things and the ever-growing government bureaucracies necessary to STAMP out the emerging competitors through endlessly growing regulations and the bureaucracies to ENFORCE them. In Europe, this process is almost complete. New businesses and entrepreneurs have NO CHANCE of maneuvering the STRAIGHTJACKET of regulations and taxes required to build a new and innovative business. The result of this is “less of everything for more”. Look no further than the agricultural, alternative energy and medical sectors of the G7 economies to see this in action. They are the epitome of government mandates and subsidies, forever distorted from the price mechanisms of capitalism. Energy, food and medical prices are SOARING and the new solution to today’s problems NEVER ARRIVE. The US is rapidly following down this path. To have a successful new business or personal success, you must “produce more than you consume” and the cost of regulations and taxes guarantees that you cannot do so on the first day of business. Savings become IMPOSSIBLE as they are eaten by the public sector. In the G7, whole societies have now lived for GENERATIONS consuming more than they produce and do not know this IMMUTABLE law of nature -- survival of the fittest. They stand on an altar of hubris upon which they will be sacrificed. Public servants tell their “something for nothing” constituents that they are the richest country on earth, when in reality, they may be the poorest based upon the amount of indebtedness. These societies save nothing and spend far more than they produce -- a recipe for bankruptcy. Savings combine with innovation and the factory room floor to create the virtuous circle that creates vibrant and growing middle classes -- the ability to create wealth as defined by Austrian Economics and Von Mises. As this has become almost “impossible to do” in the G7, the middle classes are slipping away, ground into the dirt by the constant debasement of their living standards as capitalism is substituted with the policies of socialized economies, corporatism, inflation and the benefits of incumbency. NO POLITICIAN in the G7 plans for the futures of their children. There is now only one overriding priority for a G7 public servant and that is the next election. It is so much easier for public servants to substitute easy money (monetary policy and inflation) and asset inflation for the fiscal policies of growth (less taxes, less innovation stifling regulations and less mandates). It pays them more because industries are forced into the arms of government as they fail from its policies, or FLEE to economies in which they can PRESERVE their competitiveness. Once on the subsidy bandwagon, permanent political constituencies are the result! This is why the G7 have been steadily de -industrializing for over four decades. They must move outside the grasp of G7 public servants to stay in business. It is self preservation on a corporate level. 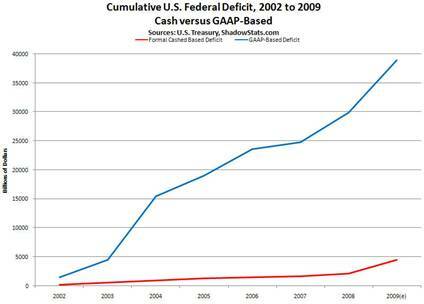 Money printing drives more and more people into government dependence. It is a silent tax. Less taxes, regulations and mandates drive constituents to freedom. Which do you think government wishes to do? Asset-backed economies rely on financial and fixed assets growing faster than the stated rate of inflation, creating the illusion of growth and rising incomes. It is the way public servants PUSH their constituents into the arms of government solutions which, when implemented, serve the government’s elite constituents and ever-growing legion of government bureaucrats at the expense of the broad public which have placed their trust and votes in them. All solutions lead to more of the government and less in the private sectors. So it’s less for you, me, and our families, and more for them. Impoverishment of the middle classes drives them into populism as they try to preserve their standard of living from the HIGH cost of government mandated products and services, and the debasement of what they hold their wealth in: currency, stocks and bonds. As this debasement occurs, middle class families are forced to find second incomes or suffer declining living standards, and even then, their lifestyles are always declining. As their futures slip away on this slippery slope, the “something for nothing” social trend is born. This creates broad swaths of voting populous mobs looking to rob the remaining wealth-creating sectors and transfer it to themselves. The public servants never do so, as their promises only sell HOPE and CHANGE to the hopeful. Cannibalism of the worst sort, they are too uneducated to understand that they will never advance economically by destroying the companies for which they work. This social trend has ALWAYS led to the demise of the empires in which it has emerged. There is no such thing as a free lunch and those who believe there is are headed to bankruptcy, both moral and fiscal. This is the broad social consensus in the G7 today. ALL GOVERNMENT SOLUTIONS ARE “less of everything for more money.” Understand that they hold NO value in the practical world, only in the politically correct one. As they accrue to their campaign and special interest supporters, rather than create benefits and practical solutions which reach the public, politically correct means practically incorrect. This is the epitome of G7 public policy today, serving crony capitalists’ something for nothing constituents and special interests at the expense of the public. Cap and Trade (taxman in disguise), Stimulus plan, healthcare and finance reform, are all forms of transfer of the public purse to the politically correct and connected elites. As this destruction of capitalism has unfolded, wealth creation became a function of ASSET inflation and asset- backed economies which are now deeply woven into the fabric of the entire G7. Inflation has become the policy of governments throughout the G7. As liabilities explode, the printing press is employed to inflate the real obligations away. This inflation has been accomplished through decades and decades of money and credit creation in excess of economic growth. In the early 1970’s, Bretton Woods II altered forever the definition of money in a subtle but very economically destructive manner. "By a continuing process of inflation, governments can confiscate, secretly and unobserved, an important part of the wealth of their citizens... There is no subtler, no surer means of overturning the existing basis of society than to debauch the currency. The process engages all the hidden forces of economic law on the side of destruction, and does it in a manner which not one man in a million is able to diagnose." Money has this definition if it can buy something next year of value equal to that which it was used to purchase today. For instance, if 100 dollars was used to purchase a barrel of oil today, then the same 100 dollars should purchase a barrel of crude oil a year from now. A barrel of crude roughly cost the same amount of gold as it did in the 1930’s. Another example is a silver dollar. In 1960, a silver dollar bought 5 gallons of gas; today it STILL BUYS 5 gallons of gas. Gold and silver purchasing power fits this definition for the most part. A dollar, euro, British pound, Swiss franc, Chinese yuan, Russian ruble DO NOT DO SO. As I have said for years (since I met my good friend Clyde Harrison who pointed out the flaw in how I think), “currencies do not float, they just sink at different rates”. The assumption that you can store purchasing power or wealth in a currency or bond is FALSE. This debasement in the G7 is DIFFERENT than the debasement in the EMERGING world, which I will cover in another part of this “Crack-Up Boom” series. In the G7, it is public servants masking their footprints of deficit spending through debt creation, confiscation of wealth through stealth taxation by printing press, and poor policies, while in the emerging world, it is a self-defense mechanism from enormous G7 FIAT CURRENCY monetary exports. In today’s monetary and financial systems, money FAILS to accomplish most of the definitions outlined above. It still functions as a medium of exchange, but can be expected to increasingly lose this function in the future. Wealth creation and incomes are collapsing in the G7. Living standards, corporate profits, income growth, rising debt levels and collapsing savings rates all point to the unfolding calamity, a slow motion train wreck which will unfold over the next decade. In a heavily-indebted, income-short economy, there are only two solutions that can be considered—inflating the obligations away or creating the policies of government that encourage capitalism, savings and Austrian economics to work their magic of wealth creation. In the emerging world, the public servants have chosen the latter, and in the developed world of the G7, they have chosen the former. It is a wonderful turn of events for the emerging world as three billion people emerge to more modern lifestyles and create new and vibrant middle classes. In the developed world, it is a recipe for “misery spread in ever widening circles”, as the economic pie and economies are always shrinking in REAL terms masked by growth in NOMINAL terms. These are the pictures of wealth destruction. 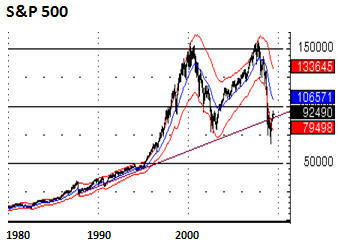 You have lost almost 75% of the purchasing power and REAL value of your stocks and bonds. When I explain this to people, most of them look at me blankly. Even at the highest levels of the investment world this is not understood, as Keynes said, “not one in a million”, and he was not kidding. Take a look at this chart showing the long-term debasement since 1961. If you think this is limited to the US dollar, think again. The US monetary base has doubled since last august and it is galloping ahead at double-digit rates, even after the great leap you see above; and it is still on a trajectory to double again in approximately three years. Once again this is the picture throughout the G7. I could continue, but the point has been made. These are economies that CONTEND that inflation is contained and running below 4% in the developed world, and less than 6% in the emerging world. “Inflation is a policy of government” and, as we approach the end game, we are now into the debt-versus-printing spiral Bill Bonner talks about; and it constitutes a crack-up boom in its infancy. Those headline numbers are used to fool the dumbest among them and they keep the man on the street as their fool and victim. This is the face of public servants and government PREYING upon their constituents. A ten-year bond or currency from these countries is a certificate of confiscation. You are GUARANTEED to lose half the purchasing power or more. The BIGGEST money in the world is operating under the false assumption that you can store wealth in global currencies, stocks and bonds. The definition of this was irreparably changed during Bretton Woods II in the early 1970’s. Now we see why commodities and natural resources are in BULL markets against ALL currencies; almost 40 years of annually-compounded debasement is finally catching up with the central bank fraudsters and their public servant masters. When Von Mises wrote this, Crack-up Booms were typically limited to one country or another. This is the biggest Crack-up Boom in history as the whole world is aboard, rather than one irresponsible government. We are looking at mass insanity at the highest levels of leadership and central banks in the world, as well as the broad public sector. The world is operating under the illusion that money has the definitions and functions outlined previously, and this IS NOT true. In this case, I believe this process will take a decade or more and when done, the FACE of the world will be quite a different place financially and economically. Crack-Up Booms also are accompanied by the conditions I outlined above of creeping socialism, falling oligarchs (i.e., crony capitalists: AIG, GM, GMAC, Citigroup, UBS, Fannie Mae and Freddie Mac, etc. ), collapsing production, incomes and de-industrializing countries. When wealth creation ceases or is diminishing, the debasement of the currency takes on an accelerated phase because the ability to meet the obligations of the debasing currency is constantly shrinking. So to pay their bills, they increasingly rely on fiat currency and credit creation. People that hold these currencies are always getting back less for them, so they increasingly hold less of them. Think of the former Soviet Union, Argentina, and Zimbabwe, Argentina (again) and Venezuela TODAY. NOW it is the G7 where wealth creation is declining rapidly and is accompanied by rapid monetary debasement. In the BRIC’s (Brazil, Russia, India and China, emerging world and the natural resource economies) growing wealth-creating economies, the expectation of recovering the value of the goods or services that you exchanged for the currency is greater as they create wealth and have savings, so they naturally will rise against the declining economies’ currencies. These economies are creating wealth by producing more than they consume, and accumulating savings and foreign currency reserves. So you can expect the BRIC’s and emerging world currencies to constantly be rising against declining G7 script. 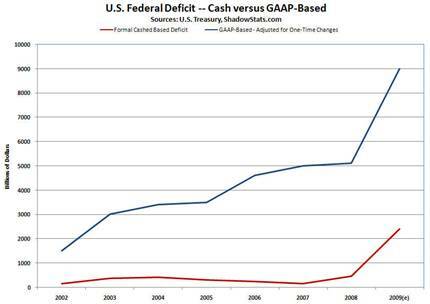 Think of it, the deficit in 2009 IS NOT $1.85 trillion as public servants and the MAIN stream media contend, it’s actually $9 Trillion in a $13 trillion dollar economy. How does a government which has 90 trillion dollars of liabilities pay it off with annual tax receipts approximately $1.5 trillion? How many people reading this letter think this mound of FUTURE obligations can be paid by TAX receipts of a government who is currently taking in approximately $1.5 trillion and spending almost $3 trillion annually (50 cents of every dollar spent by the US government is BORROWED and the picture is no better in the G7/Euro Zone) and promising new entitlements every day? Cap and Trade is NOT a climate bill, it is a tax bill. It is also called a JOBS bill, as with everything out of the beltway it is the antithesis of it, it is JOBS killer bill as in Europe where these policies are already in place over 2 jobs are LOST for every new GREEN job. NOT a recipe for rising TAX receipts. It’s Hi ho Hi Ho off to the printing press they will go. These debts and future liabilities are UNPAYABLE and INEXTINGUISHABLE except through the printing press. Next week at the Freedom Fest in Las Vegas, we will have two breakout sessions (one on Friday and one on Saturday) where we will address the issues you must deal with to create OPPORTUNITIES from these realities and how to recognize the PITFALLS which must be avoided – DON’T MISS THEM. The misconceptions of investors around the world are opportunities for informed investors. Now you know why I say bonds are BOMBS, as is anything which can be printed, such as G7 currencies. Emerging market, BRIC and natural resource currencies, such as the dirham in Dubai and other currencies, hold relative advantage over G7 script. But is it relative? Yes it is. 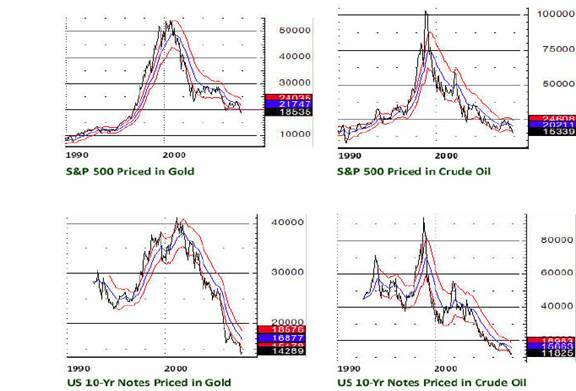 CURRENCIES DON’T FLOAT, THEY JUST SINK AT DIFFERENT RATES. Some just sink more slowly, such as those in economies that are CREATING wealth, building savings, investing in infrastructure, plants and equipment. Their ability to pay is rising, rather than shrinking in real terms like the G7 – where wealth creation and income are plummeting and a shadow of what they were, where taxes are rising and debt are skyrocketing, and where infrastructure is neglected and sensible, cost-effective energy is increasingly outlawed. Additionally, plants and equipment investments, marginalized through micro-regulation, are potentially unprofitable so they are transacted OFF SHORE. Capital is misallocated to subsidize politically correct industries (consume more than they produce at radically higher price of their products), rather than economically VIABLE industries (produce more than they consume and deliver solutions at a small fraction of the price of the politically correct and connected ones). The solvency crisis in the G7 banking and financial industries is a supercharger to the arrival of the ultimate demise of the G7 EMPIRES, currency and financial systems and final ingredient to fuel the unfolding Crack-Up Boom! The federal Reserve is Monetizing billions of dollars a week and have printed, or plan to print over $1.700 trillion in total monetizations this year; the European Central Bank monetized Euro 442 billion ($618 billion) just last week. Many think the US is an empire. No, it is the whole group of developed countries that is known as the developed world and are parties to the financial systems known as the G7. Their handmaidens in the global financial industry are the supposed NGO’s such as the IMF, IEA and World Bank. They are called non-governmental organizations (NGO’s) to create the illusions of non-partiality. In actuality, they are proxy government organizations of the G7. They are in order: the taxman in disguise, exporters of the internally crippling poor policies of the G7, socialists, and most importantly, the purveyor of the fiat currencies and credit regimes, confiscating their ‘citizens’ and your wealth through confiscation by debasement. Looking at traditional safe haven investments such as T-bills, government treasuries, bonds and plain old cash, the terms ‘safe’ and ‘risk free’ are the antithesis of what they truly are. Main-stream money center and investment banks do not have any products which can withstand the wealth destruction of what has and is transpiring and unfolding at this time. Short circuiting the printing press and turning it to your benefit can be done and you must do so now. Look no further than the current gang of 545 in Washington to see how they are trying to OUTLAW commodity index investing which is an absolute method of short circuiting the printing press. They are outlawing the method your pension funds use to protect your retirement funds. Can you say ‘absolutely immoral?’ If they outlaw commodity index investing, it will move offshore and be unlawful for US citizens to benefit from this self-preservation from debasement. The fall of Rome took decades, if not a century, and we are far along in this process. New empires are emerging and global economic power is rotating. New capital markets are being built worldwide in the Middle East and Asia. These new financial centers will gradually build to the point that they can handle the capital management duties of the emerging world at which time New York and eventually London will be severely diminished. Don’t miss the next edition of Tedbits. 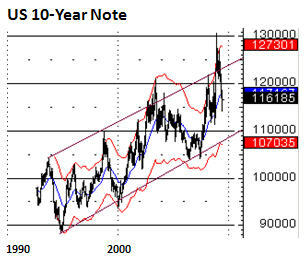 Thank you for reading Tedbits if you enjoyed it send it to a friend and subscribe its free at www.TraderView.com don't miss the next edition of Tedbits.